We love this okra recipe. 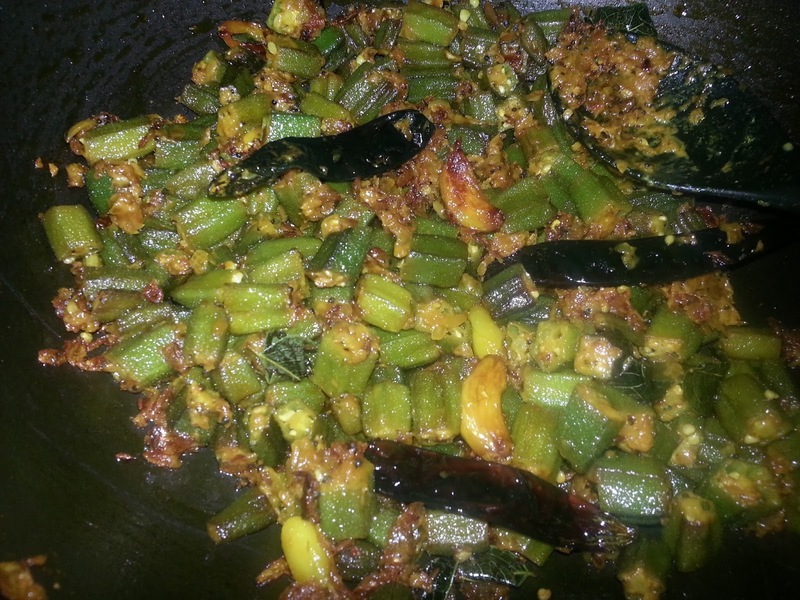 I prepare it whenever I find good fresh tender okra. The garlic used in the recipe also tastes excellent. The okra is soft and not crispy. It goes well as a side dish to rice or with chapatti as an accompaniment. 1. Wash and dry okra. Chop the top and tail ends then cut each into 4-5 pieces. 2. In a cooking vessel heat oil and reduce to medium flame. 3. Add mustard seeds and once they splutter add cumin seeds. 4. Add curry leaves, dried red chillies and garlic cloves. 5. Fry for about a minute and then add onions. 6. Fry the onions till they turn translucent. 7. Add okra, chilli powder, turmeric powder and salt and mix well. 8. Stir for 3-4 minutes. Reduce flame to low. 9. Add 2 tablespoons of yogurt and let it cook 5 minutes stirring regularly. 10. Reduce the flame to low and keep frying till okra turns soft and a little brown. Make sure not to burn. Roast for about 15-20 minutes.